In the Simpsons episode ‘Flaming Moe’s’, Homer tells Moe about a secret cocktail drink including cough medicine and fire, that he calls “Flaming Homer”. Moe steals and serves the drink, calling it “Flaming Moe”, and Springfield becomes a hot spot to travel to. Aerosmith show up to drink and end up jamming with Moe onstage at Moe’s Tavern. While the band plays on stage, the drummer Joey Kramer is stuck in the band’s tour bus being propositioned by Edna Krabappel. Green Day perhaps made one of the longest and most interactive Simpsons appearances in the history of the cartoon. 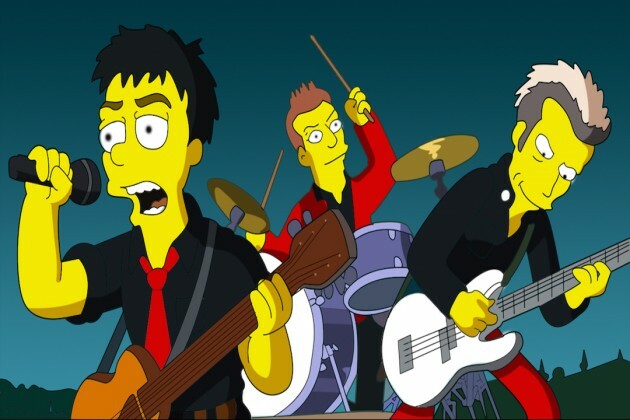 During the opening credits of ‘The Simpsons Movie,’ the band play a Green Day version of the Simpsons theme song with the happy residents of Springfield rocking out to the band. Performing on a floating barge, the overly polluted waters of Springfield deteriorate the stage, leaving Green Day to go down with the ship and play themselves off with violins. 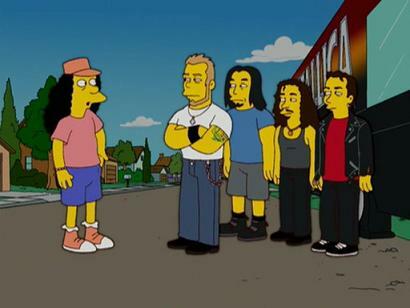 Metallica show up in The Simpsons in the episode, "The Mook, the Chef, the Wife and Her Homer," when their tour bus brakes down while driving through Springfield. 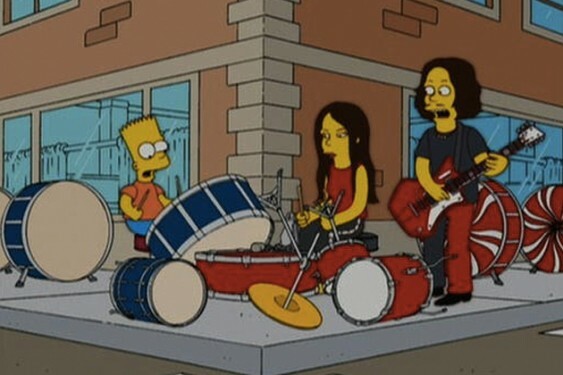 While driving Springfield Elementary School's students to school, Otto stops to meet the members of Metallica, while they’re stuck on the side of the road. Behind him, however, Bart takes over driving the school bus, saying "Look at me, I'm Otto! I'm a hundred years old and I'm driving a school bus!" and drives it to school, embarrassing Otto in front of Metallica. 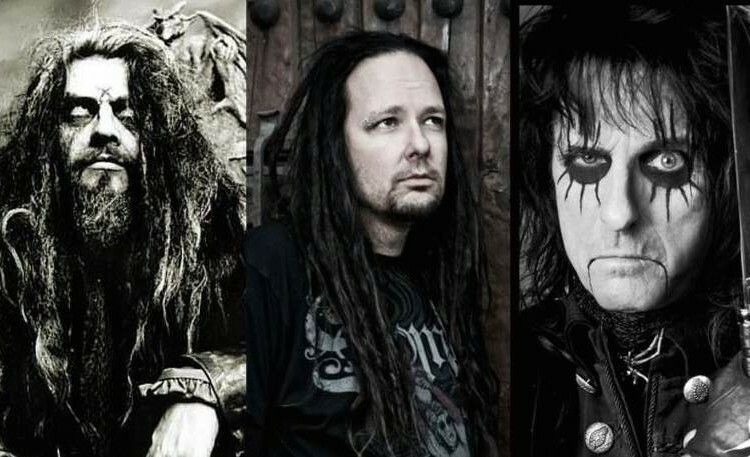 Kirk Hammett calls out to Otto, "Hey loser! We got a ride from a real fan!" 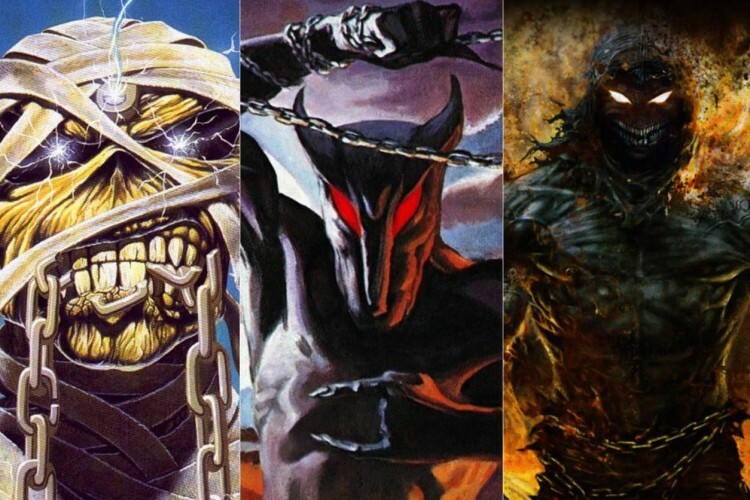 and Robert Trujillo tells him "Never listen to our music again!" When Moe’s Tavern goes upscale, the regulars feel out of place and Homer decides to open his own bar in his garage, disguising it as a hunting club to avoid liquor license restrictions. 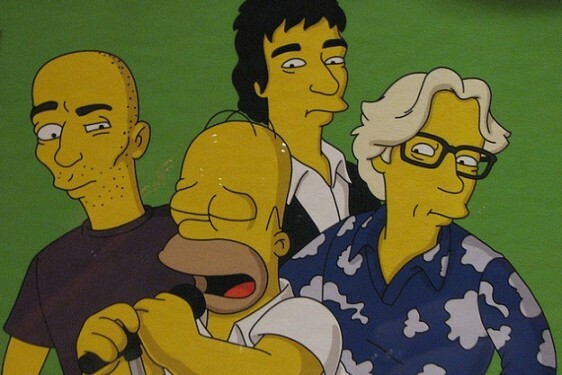 The episode featured R.E.M, who appear as themselves, to perform ‘It’s the End of the World As We Know It’ at Homer’s “hunting club.” Moe tells Homer the club must participate in the sport of hunting in order to be a hunting club. This causes Homer to hunt for a thanksgiving turkey, but he ends up shooting Moe in the leg and vegetarian R.E.M. singer Michael Stipe provides everyone with a vegan feast instead. U2 singer Bono appears in The Simpsons episode ‘Trash of the Titans’, which features Homer running for Springfield’s Sanitation Commissioner. 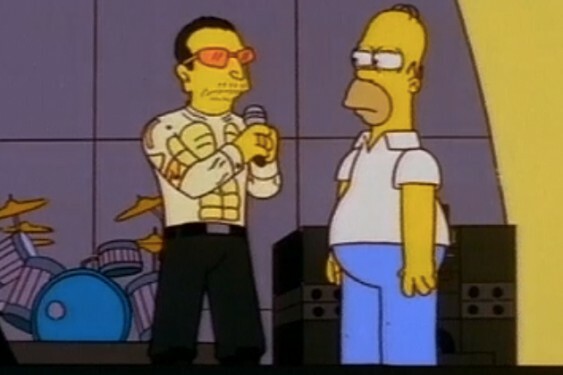 Homer interrupts U2’s PopMart Tour concert during the song ‘In the Name of Love’ to talk about trash and activist Bono joins in. 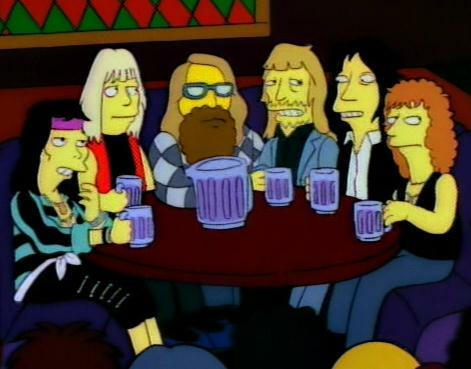 The rest of the band retreats to Moe’s Tavern and U2’s bouncers beat Homer up. 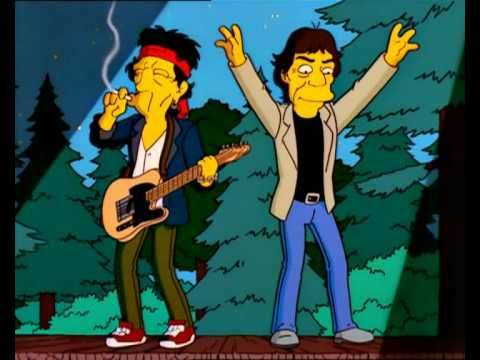 In The Simpsons episode “How I Spent My Strummer Vacation”, Homer and several other Springfield regulars head to rock’n’roll fantasy camp, hosted by Mick Jagger and Keith Richards of The Rolling Stones. When the camp is over Homer doesn’t want to leave so Jagger offers him a chance to perform at a benefit gig, the Concert for Planet Hollywood. 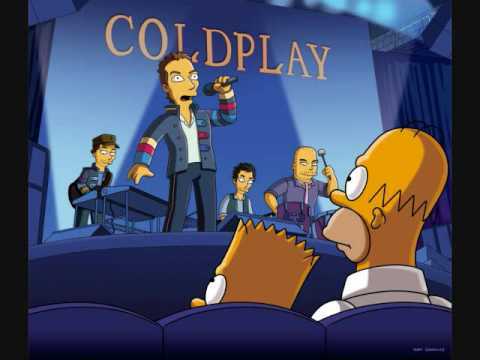 The Simpsons episode, "A Tale of Two Springfields," finds Homer trying to sabotage a Who concert in Old Springfield. 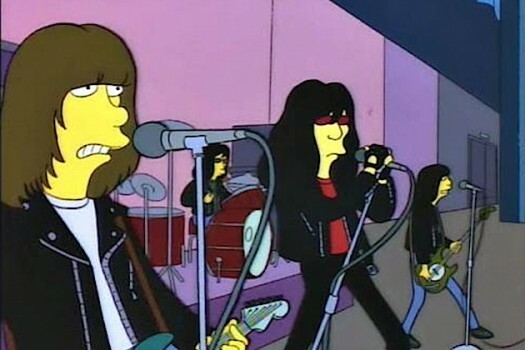 Homer and Bart convince them to play the concert in New Springfield instead. 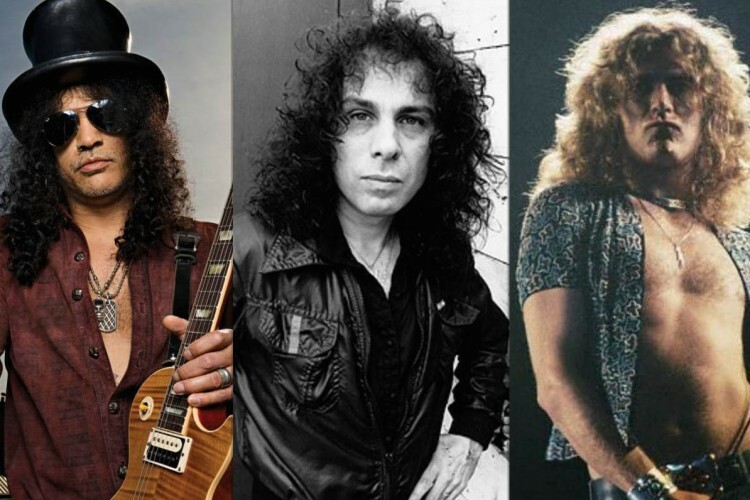 It features most of "Won't Get Fooled Again"; in fact, an A chord from the song destroys the wall between the two Springfields, allowing the citizens of Springfield to reunite. 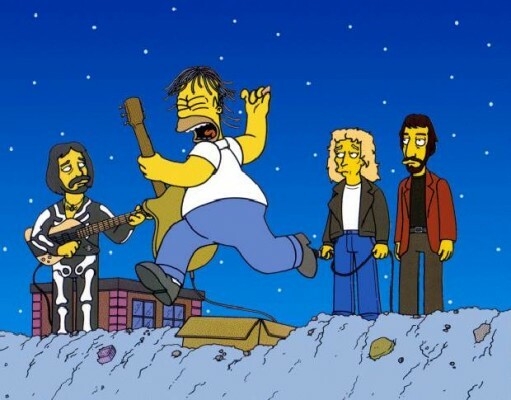 Along with Sonic Youth, Cypress Hill and Peter Frampton, the Smashing Pumpkins were featured in ‘Homerpalooza.’ The episode parodied the Lollapalooza music festival. 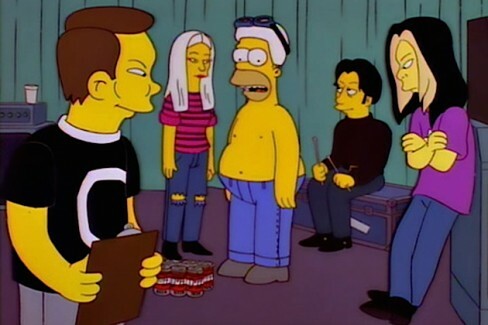 The Smashing Pumpkins became friends with Homer as he toured with the festival, getting hit with cannonballs as a part of the traveling freak show. The Pumpkins played ‘Zero’ for the dazed and apathetic ‘Hullabalooza’ audience, with frontman Billy Corgan getting a few lines in throughout the episode.